Peerless Industries, Inc. has introduced the new HG Series Universal Flat Panel Wall Mounts, developed to extend the stylish appearance of the flat panel all the way to the wall, providing a clean, elegant look to any installation. The new HG Series includes pivoting and articulating plasma and LCD wall mounts to complement the look of the latest flat panel screen finishes — high gloss piano black or high gloss silver — adding to the upscale appearance of the installation. 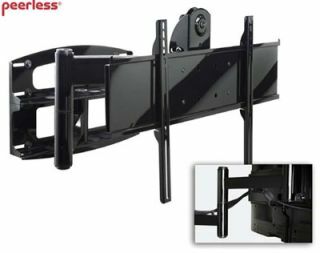 The new mount series accommodates screens from 26 inches to 60 inches. The new HG Series of Universal Flat Panel Wall Mounts are available now. Pricing for the pivoting and articulating high gloss piano black or high gloss silver models ranges from $449 for to $749.